Knowledge is power, freedom, mischief and mayhem! 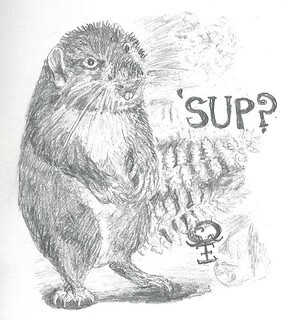 The Tale of the Mysterious Rodent, Solved! Matt Crowley on investigating "bigfoot dermal ridges"
The bigfoot legends began with Native American stories about giants, and next I moved on to stories about little people, as told by the natives of Flores. Imagine how excited I was to find that such a species really did once exist, at least thousands of years ago! Of course, if there really were any bigfeet or Ebu-Gogo, I'd want to conserve them. Species probably go extinct every day, including ones we haven't discovered, and some of them are very valuable in terms of what we can learn from them and/or other species needing them in order to exist. Siberia: nearly 105 Years Between Giant Space Rock Collisions! There's much more down-to-earth things to worry about than that, however, such as infectious diseases. Thank goodness for the medicine that we have! Nine Years of Numbness Reversed With Hypnosis. It has many uses, of course. Hypnotizing one's way out of a traffic ticket, and other shenanigans. You know, because Rob's awesome like that. Vince Lynch Interviewed Rob Today! This next post actually used to be an article on this website: It's about what happens when two young men take video of themselves tying flares to balloons and then wait until the flares make national news as the Morristown UFO before they show the footage to anyone. Unidentified Flying Insects flit across the sky over Denver! If you think my attitude is suspicious, you're right! One of my favorite topics is evolution, and so it shouldn't be a surprise that one of my favorite topics to pick apart is creationism. ` Interestingly, the creationists I've known who have actually bothered to learn what evolution is are no longer creationists and now understand my writings on this. ` The ones who have never learned what evolution is actually think that creationist propaganda describes evolution pretty well. Thus, they think I'm either too arrogant to "see the truth" or am lying through my teeth. I was at a convention called The Amazing Meeting 2012 (named after James "The Amazing" Randi), which is full of scientists, magicians, and other people who are into discovering new things, solving problems, dissolving illusions, and exposing scams. I STILL LOVE YOU FOREVER, MAYNARD!!! Neil DeGrasse Tyson, I scream for you like a leetle girl! I can't escape the pebbles! Because pulling things back from the depths of time is resourceful. Here's a small bit of humorous commentary involving theoretical physics. Well, better get back to writing blog content. Wish me luck!